A story has to have a point. I know the temptation of just rambling along without really having anything to say. Whenever I read somebody else doing that in a blog, I tell myself never to do that! But there are always exceptions to the rules, and today I have nothing special to say and I feel like just rambling along. Since last week I know how to make PDF files, and that seems a nice format to publish some of my Kladblog pages. But I don’t know; I better sleep another few months over it. Ruud Hulleman (who is still working hard on his great Talblog ) send me a link to Bizarre Records, that might be worth visiting if you don’t already have it in your Favourites. 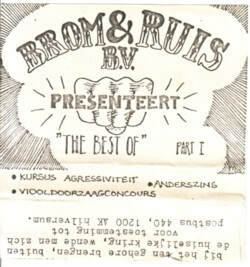 I had a dear cassette tape with some highlights from De Brom &Ruis Show. That was a part of Raufaser, a KRO-radio program that was broadcasted weekly in the eighties. You could order that tape, and as far as I know that was the only tape. My son ruined turned the tape into what in Germany is called ”Bandsalat” . Recently I discovered that the makers of Raufaser have made two mp3-CD’s with all the programs! But in a limited edition, only meant for the people that had to do with the show. I mailed to the guys and begged them to sell me those CD’s, but they didn’t want to make extra copies for me. Stupid: in the end everything turns up anyhow, so why not give it while people want to have it? This is so past century thinking. So, if you happen to have these mp3’s, please let me know what you want me to do to get a copy! 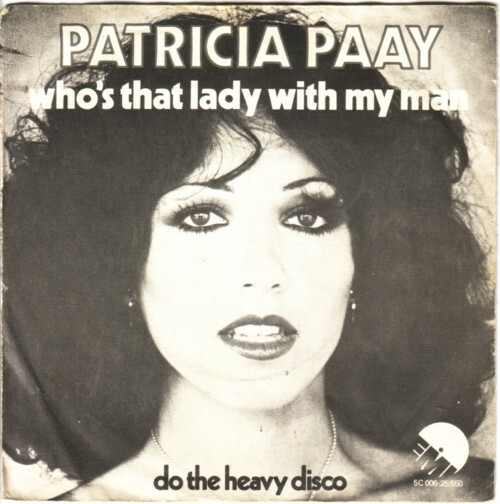 The A-side is a nice disco hiy by Patricia Paay, but it is the B-side that I was after. It is an instrumental composition by Jaap Eggermont, called ”Heavy disco” . Nothing special, but a song that is part of the Soundtrack of my life. Or, better said, part of the period when I began to discover that there was music on the B-sides of my 45’s too. Geweldig! De Brom en Ruis show. Ja, ook die interesse delen wij. Ooit ontmoette ik één van de twee heren, toen ik als hout -en glasmannetje bij de Praxis in Amersfoort werkte. Ik herkende hem aan zijn stem. Hij zei dat ze er jaren later pas achter kwamen dat er zoveel jongeren naar het programma geluisterd hadden en dat het zo leuk gevonden werd. Anyway, ik had één van de afleveringen op casetteband, die over pyramides en kunsthoofd-stereo. Het bandje is inmiddels praktisch vergaan en slechts fragmenten ervan heb ik nogeens gebruikt in collages. Ik ga net als jij op zoek naar die mp3’s!